It's Christmas, 1934, and the citizens of Darling, Alabama, are unwrapping a big package of Christmas puzzles. Mildred Kilgore and Earlynne Biddle are planning to open a bakery on the square--if they can come up with the right recipes. Charlie Dickens faces two of the biggest puzzles of his career as an investigative reporter, and one of them involves his wife. Cute little Cupcake's talent as a singer and dancer makes her a tempting target for an unscrupulous exploiter; Lizzy must enlist the Dahlias to protect her, while she herself is confronted by a romantic puzzle. And Sheriff Norris is forced to reopen a puzzling mystery that the town thought was solved and follow a string of clues that lead to a deadly situation at the nearby prison farm. 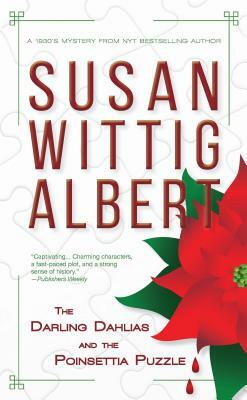 Once again, NYT best-selling author Susan Wittig Albert takes us to a place where real people have courage, respect their neighbors, and dream of doing their best, even when they're not sure what that is. She reminds us that Christmas is a celebration of friendship, community, and what's right with the world. There's nothing puzzling about that. ​Bonus--Liz Lacy's Garden Gate column on poinsettias, plus the Dahlias' collection of traditional sweet Southern goodies for the holiday table, garnished with some cookery history. Reading group questions, more recipes, and Depression-era background at www.DarlingDahlias.com.